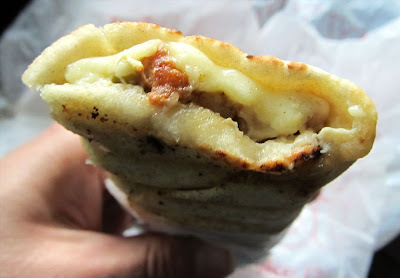 I got take-out from a middle eastern restaurant in Melbourne called King of the Gyro one afternoon. I decided to go against the restaurant's namesake and ordered a chicken wrap instead. 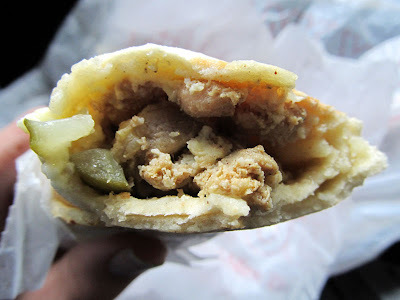 This pita was filled with chicken, garlic sauce, mayonnaise, and pickles. The pita was good for what it was, but I found it to be somewhat boring. There was too much chicken and not enough other sandwich fillings. The garlic flavor was nice, but more vegetables never hurt in my opinion. On one of the first colder evenings of the fall, I decided some soup sounded good. I was in Melbourne and found a Chinese take-out called New China. I went in and ordered a quart of wonton soup. The soup was good, although a little on the salty side. There was plenty of wontons and each dumpling had a good amount of meat inside. No shredded pork at the bottom of the soup though. Overall, it was pretty average as far as Chinese take-out soup went. Not the best, but not the worst either.